Leave the present behind and step back in time as you enter this beautiful farm on the banks of the historic Shenandoah River. Cedar Point Farm is located just 75 minutes from the Capital Beltway and is a scenic yet convenient destination for the mid-Atlantic region. A stay at Cedar Point Farm is magical for families, couples, groups of friends and individuals on retreat – all find this to be a special place. Cedar Point Farmhouse is a cabin nestled in the hillside less than 200 yards from the river and offers breathtaking views of both the Blue Ridge and Massanutten mountains. 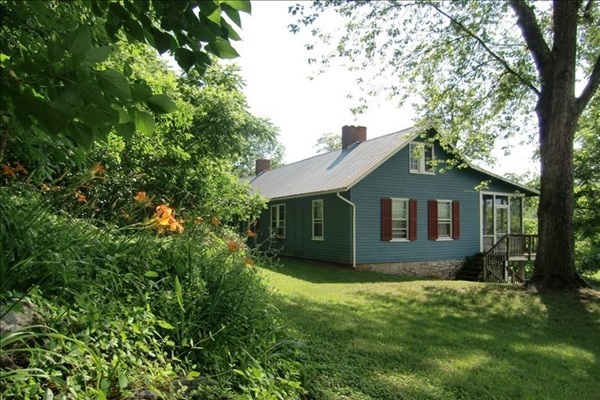 The historic farmhouse is spacious and comfortable, with modern conveniences. Scenic fields, woods and the river surround it, offering year-round opportunities for walks, enjoying nature (including starlit nights), fishing and swimming in season, or just relaxing in the hot tub or sitting on the screen porch taking in the view across the fields. In addition, our Valley has activities and events to satisfy every visitor’s interest, within a short drive. Cedar Point Farmhouse is smoke-free. Any cancellations made within 14 days of your arrival will be billed the total cost of rental on your reservation receipt. Guests will be responsible for any property damage over and above normal wear and tear, property theft and unauthorized use of the property.